This homemade cherry cake from scratch is beautiful. So moist and tender - topped with fluffy white frosting; it's a old fashioned cake recipe extraordinaire. I offer many more homemade cake recipes for you to try at the bottom of the page, and all are just as delicious. PREHEAT oven to 340 degrees and grease and flour two 8" cake pans. For the cake: cream the butter and white sugar together for five minutes. Sift flour before measuring it. Add salt and baking powder to the flour and sift again. Add alternately with the liquid. Cut cherries in quarters and dredge with nuts in the two tablespoons of flour and blend into the batter. Fold in stiffly beaten egg whites. 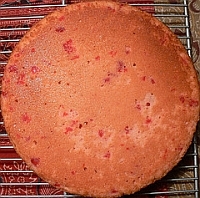 Put in prepared cake pan and bake for 60 minutes. Remove from pan and cool on cake rack. Ice with fluffy white frosting (below). For the frosting: measure sugar, cream of tartar, cold water and egg whites into top of double boiler and mix well with a spoon. Place over boiling water and beat with a hand mixer until icing will stand in peaks. Remove from water and add the vanilla and beat until consistency for spreading on cake is achieved. You can keep this frosting in a jar in the refrigerator for later use. **Add the saved cherry juice to a measuring cup and fill up to 3/4 line with milk.